So, as Halloween approaches I've done enough googling for Halloween costumes for about 3 people. So I'm going to show you some of the costumes that I seriously considered! I like costumes that are a little more conservative, and usually had a male pairing because Chris and I are finally able to do a couples costume this year! I came across an amazing makeup tutorial on how to do a broken doll makeup. I spent a very long time looking for the proper costume to compliment the makeup I was planning on doing, and eventually settled on this dress shown on the left. My favorite color is purple and I had amazing ideas on how to style this. I hate ordering costumes and clothing online sometimes, because I can't touch the fabric. But the reviews online for the dress were amazing. 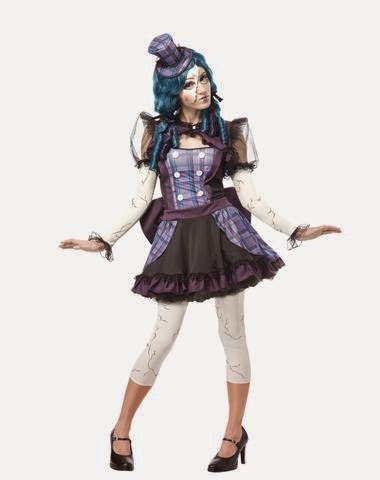 If you like this costume I found it on Spirit Halloweens website. I didn't end up picking this one though because Chris didn't want to be a doll or a puppeteer. Plus I had to think about its wearability throughout the night while I was hosting a party, so I eventually decided against this. Seriously traditional Day of the Dead Sugar Skull. The print on this dress fabric is amazing! I am obsessed with skulls and have been obsessed with Day of the Dead since I was really young. I couldn't find this dress in my size anywhere. I went to 2 different Spirit Halloween stores that cropped up. After being throughly disappointed that my size wasn't available, I realized this probably wasn't the best idea either for hosting a party. The skirt is really poofy and the dress overall is pretty short. Good for parties, not good for hosting. I'd be wearing some ruffly bloomers under this if I went with it! Click here to see this dress. This is the costume I ended up choosing! It was fairly conservative, easy to wear, and Chris wanted to feel like Robin Hood so I went with it. Plus we were pretty big gamers so taking up an archer class and a rogue seemed like fun and took us back to our roots. This costume was LIGHT, easy to wear, and it was actually a little bit too big! Which is going to be perfect for hosting the party! I had just recently got the PERFECT boots to match this outfit, and under the shirt/dress all I have to wear is a comfortable pair of tights! The makeup I'm going to wear with it is more earth momma, with a combo of bronze, forest green, and a light creme. I'm planning on doing some serious contouring and braiding my hair just how it is in the picture. 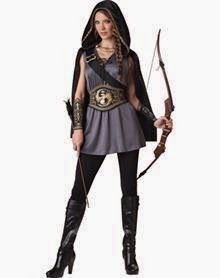 One thing that I had to hunt for was the bow and arrows, can you believe a Halloween store didn't have proper bow & arrow?! I ended up buying two from Target because they were buy one get one Halloween accessories.